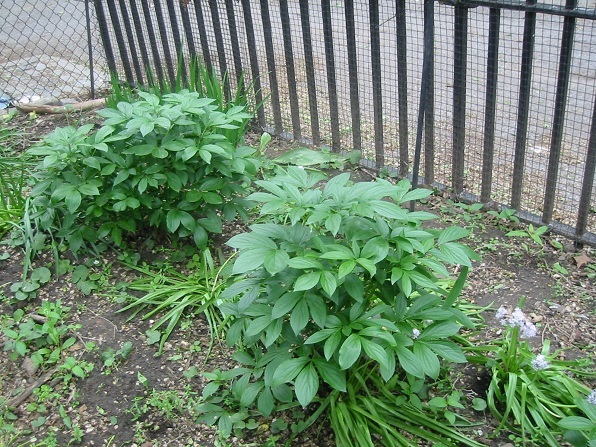 At the time of this photo, these peonies (transplanted last year) have not yet bloomed. Peonies are perennial favorites in the flower garden. Few herbaceous plants can rival them for floral display and foliage. Their exquisite, large blossoms, often fragrant, make excellent cut flowers and the foliage provides a background for annuals or other perennials. Peonies thrive in sunny locations and well-drained soils, tolerating a wide range of soil types. Best growth is in soil with a pH range of 6.5 to 7.5, deep and rich in organic matter.